King’s singular tone has everything you’d want to hear in electric blues guitar—a bell-like ring with a hint of overdrive, soaring highs and gritty lows, and all driven home by King’s mighty left hand tremolo. The Epiphone B. B. King Lucille was designed by B. B. King himself and puts all the tone and nuance of King’s own favorite guitar in your hands. As with all Epiphones, Lucille comes with our Limited Lifetime Guarantee and 24/7/365 Gibson Customer Service. Get the thrill and play the Epiphone B.B.King Lucille today at your Authorized Epiphone Dealer. Lucille’s ES-style body shape features a maple top and body and is constructed without f- holes. King has always preferred ES style guitars, most prominently the ES-355. To get the tone and volume combination that he wanted for his sound, King found he was often on the verge of feedback. His solution was to ask the Kalamazoo factory to make a version of Lucille without f-holes. 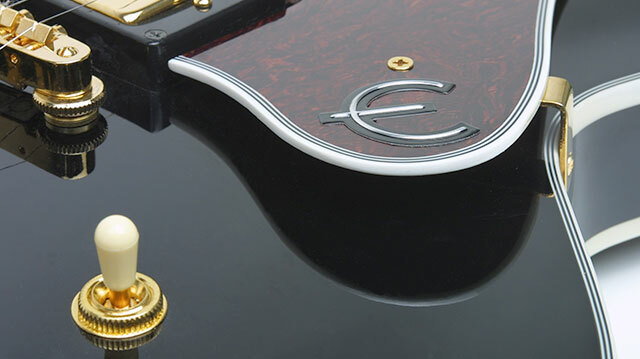 Lucille’s biting tone comes from two Epiphone Alnico Classic™ humbuckers with gold covers framed by a classic multi-bound tortoise shell style pickguard with historic metal “E” insignia. An indelible part of King’s sound also comes from his subtle use of the Vari-tone ™, control which is identical in principle to the vintage models that King uses on stage. 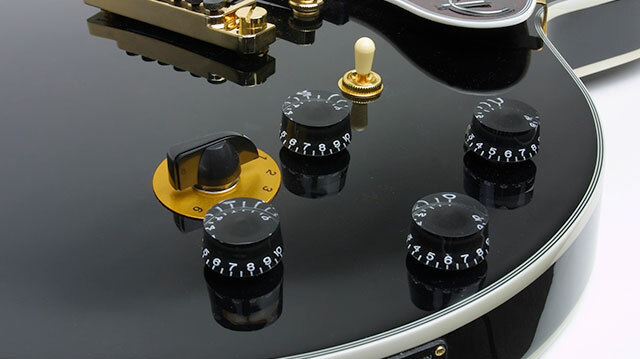 The VariTone™ uses a six-way rotary switch which engages 5 pre-set notch filters and a bypass. In position one, the VariTone™ is completely bypassed. As you rotate the rotary switch into positions 2-6, the center frequency of the notch filter shifts from around 1.9kHz down to 130Hz, providing a player with a wide tonal palette unavailable on most other instruments. Positions 2 through 4 offer tonal shaping while still maintaining great clarity. Position 2, (5db at 1960 Hz) is B.B.’s favorite! But keep turning and you’ll find Positions 5 and 6 shape-shift the Alnico Classic™ Humbuckers into a single-coil style pickup but without the thin quack usually associated with traditional single coil pickups. Add it all up and between the 6-position VariTone™ circuit and the 3-position toggle switch, you have 18 unique tones available. Outputs include a 1/4” Mono output (both pickups or neck pickup in Stereo mode) and 1/4” Stereo (bridge pickup). 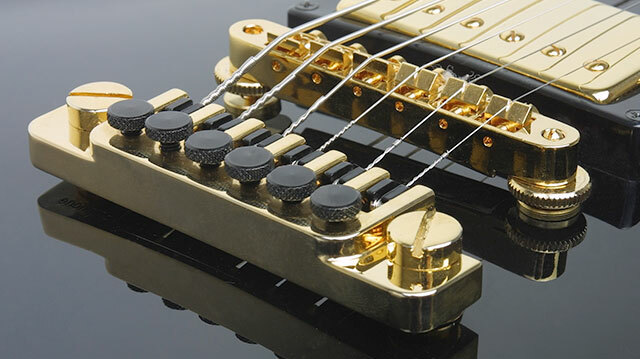 Along with an ebony finish and gold hardware, the B. B. King Lucille also features the Grover® machine heads and Epiphone’s famous LockTone ™ Tune-o-matic bridge with a TP-6™ fine-tuning StopBar ™ tailpiece for precision intonation during bends.